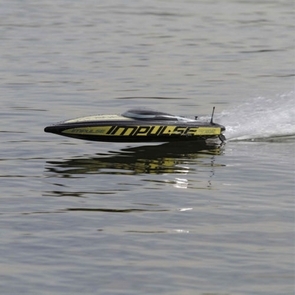 This amazing radio controlled boat has been called the Spartan slayer. From tip to tail, the Impulse 31 Deep-V is built for performance. It�s ferocious yet graceful and dishes out speeds in excess of 50 mph while remaining firmly glued to the water, thanks to its race-engineered hull and competition-ready running gear. And it�s no slouch in the looks department either. From the black and red trim on its fiberglass hull to its anodized rudder and propeller strut, the Impulse 31 Deep-V is a powerhouse capable looking to unleash fury on the closest lake or pond. Comes with metal propellers!